Just like the keychain you can never find with your unusual name on it, it can be a real challenge to find gifts made specially for uncles. Though not every gift needs to be labeled, sometimes it’s just nice to have a little personalization to show our uncles just how much we care! In some ways, your uncle is just as important as your dad. He will likely not ever yell at you to clean your room, he’ll treat you to a meal or other fun adventure, and it’s always a good time when he comes over for a visit. Take the opportunity this holiday season to show him just how much he means to you with one of our 40 best Christmas gifts for uncles! What better gift to give to uncles who love food than the gift of taste? You can’t go wrong with a holiday food basket or products to keep their favorite foods fresh! Craft Beer Club– Get your uncle the gift of flavor with this craft beer club membership. Focused on beer from craft breweries across the country, this gift is sure to be a hit this Christmas, and for months to come! 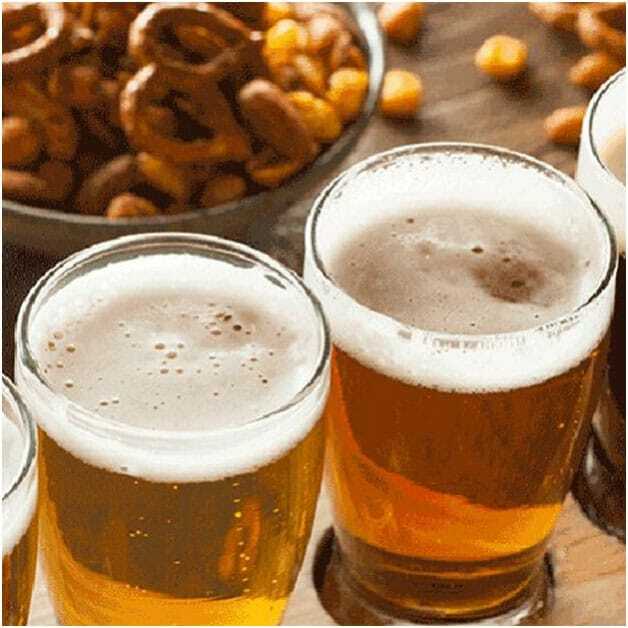 Brooklyn Brew Shop Everyday IPA Beer Making Kit – All supplies are included to make perfect craft beer at home are found in this fun gift. There are several different flavors available and this kit makes 1 gallon (9-10 12 oz. bottles) of 6.8% alcohol by volume beer. Personalized Family Cookie Jar– Another perfect gift for the foodie uncle, this personalized cookie jar can be made with a fun message or family name. You can even customize it with family member characters! HANGRY Kit – Complete with more than 20 of the most popular name brand snacks, this package meets every craving for the carnivorous uncle. With a variety of protein options, this gift set has it all. He’ll never have to resort to rabbit food again! FRIDGEFRESH– Perhaps the perfect gift for the health-conscious uncle! Made to prolong the life of fruit and vegetable products, FRIDGEFRESH will save your uncle money on groceries and help him be budget conscious while eating healthy! Uncle Gift Pint Glasses 2-Pack – Two clear pint glasses hold any beverage and are imprinted with “Best Uncle Ever” for that special guy in your life. They are dishwasher safe and lead-free. Gold Wine Club– For the classy uncle, we bring the gift of relaxation and taste. This wine club allows you to choose between 2 or 4 bottle shipments and pick between different whites and reds. Zombie Cajun Hot Sauce Gift Set – For the spice lover, this pack of 4 6 oz. gourmet Louisiana Hot Sauces, including garlic, cayenne pepper, habanero and jalapeno makes the perfect present. As a bonus, a copy of the “Zombie Cajun Chronicles” paperback comes with it, so he can learn all about the zombie legend. Chillsner – There’s nothing worse than a good drink gone warm. Keep any bottled beverage nice and cold with the Chillsner! This product inserts directly into the bottle and is perfect for tailgating, parties, and barbeques, and acts as a great way to preserve your uncle’s drinks! Does your uncle love to travel, hike, or embark on other crazy adventures? Help him to travel safely and memorialize his adventures with these great ideas! 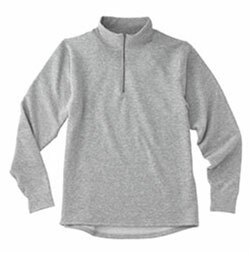 Men’s Moisture Wicking Expedition Weight Stretch Zip-T – What a smart way to keep your uncle warm in the cold! Soft performance fabric makes this an excellent choice for outdoor activities this winter. Night Vision Goggles – A superhero lover’s dream come to life! Who hasn’t ever wanted to see in the dark? With these, your uncle can go anywhere in any conditions and see just as clearly as day. This device works well both indoors and out. CRKT Squid Knife – A folding knife inspired by tactical gear, this compact device is able to handle all cutting tasks. It comes with a pocket clip and a grooved blade for an excellent grip, and even features a frame lock for safety. An essential tool that your uncle will surely need for his next trip! 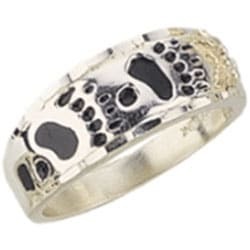 Men’s Black Hills Gold Silver Bear Track Ring– Another great gift for adventurous uncles, or those who love to accessorize, this black hills gold ring is engraved with antiqued bear tracks accented with colored leaves is sure to make a statement this holiday season. Fitsok ISW Trail Cuff Socks – Typically socks would be a boring gift, but not these! This 3-pack of trail-running socks offers a merino wool blend for optimal odor and moisture repelling capability. They are lightly cushioned and are primo performance socks for all uses. ThePhotoStick Mobile – If your uncle takes a lot of pictures, he probably has them stored on his phone, computer or even in the cloud. But what happens if something goes wrong? Thousands of memories of adventures are gone forever. Not anymore! This device quickly and easily stores up to 60k photos and videos by simply plugging it in. He’ll never worry about losing those precious photos again. YETI Rambler Vacuum Insulated Stainless Steel Bottle – From this famous brand comes a tumbler that not only keeps beverages at just the right temperature, but also is a statement-maker. Maybe you’re looking for that gift that has that extra personal touch. These gift ideas are perfect for uncles who love jewelry, coffee, or quirky items! Personalized Black Stainless Steel Spinner Ring– The perfect memento for your uncle to carry at all times, this elegant and sophisticated spinner ring can be engraved and purchased in sizes 5-14. 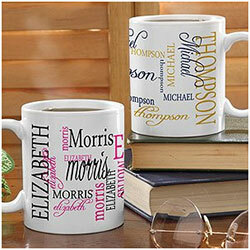 Signature Style Personalized Coffee Mug– Available in an 11 oz. or 15 oz. size, this custom mug is perfect for the coffee or cocoa loving uncle in your life! Custom Bobblehead – Upload a photo or two of your uncle to have him forever immortalized in the silliest possible way. Everyone will get a laugh out of this, and he’ll treasure it forever! 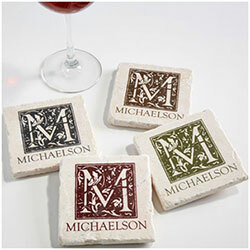 Custom Monogram Stone Coasters– Personalization is key for a unique gift for your uncle! These beautiful stone coasters can be monogramed and printed with your uncle’s name to add a special touch. 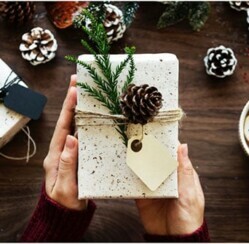 If you are looking for a more practical gift that your uncle can use, then these ideas are perfect for you! Momoday Bluetooth Music Soft Warm Beanie Hat – This cozy light gray beanie includes a wireless stereo headphone headset. He can stay warm, look great and listen to his favorite music or answer his phone – all hands-free! 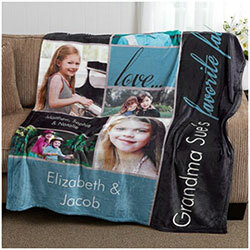 Custom Photo Collage Blanket– Keep your Uncle warm this holiday season with a blanket of memories! This fleece photo blanket is the perfect throw, and can be further customized with a heartfelt message. Tactical Pen for Self-Defense – Made from CNC machined aircraft grade aluminum for extra strength, this pen does more than just write. It contains a flashlight, window breaker, multi-tool, bottle-opener, and is created for self-protection emergencies with its Kubotan-like design. Engraved Silver Pocket Watch – Add a monogram to the front and up to 5 lines on the back of this classic timepiece. Rothco Venturer Travel Portfolio Bag – The small bag that can hold it all! Made for the traveler, this bag features numerous pockets for items of all sizes, including a 7″ tablet, he’ll wonder how he ever traveled without it! Facial Hair Scissors (Rounded Tip)- Easily yet safely trim facial hair with these specially crafted clippers placed in a leather case. Blackout Bands – Who wants to wear an eye mask on a plane? This eyewear looks like sunglasses but blocks 98% of the light around you so he can actually get some much-needed rest. With the added UV protection, they also work well for laying in the sun! Philips Norelco Multigroom 3100 – This affordable trimmer comes with 5 attachments for cutting sideburns, beards, mustaches, eyebrows, nose, and ear hair! It is 100% water-resistant and has 18 different length settings. FIXD – Usable on all vehicles manufactured after 1996, this device tells you what’s wrong when your “check engine” light comes on. Don’t let your uncle spend hundreds on a mechanic’s diagnosis that doesn’t even include repair. Instead, he can find out for himself what the malfunction is. MindInsole – Perfect for uncles who work on their feet, this product massages your feet every time you take a step with the ancient art of reflexology. Magnetized, they stimulate the pressure points on the feet to relieve pain, reduce strain and boost energy. Looking for the perfect gift for your sentimental uncle? These ideas allow you to add a personal touch to his favorite memories! 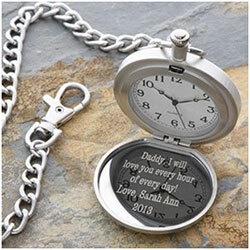 Custom Engraved Picture Frame– Commemorate your favorite moment with your uncle in this custom engraved wooden frame. This sentimental present will be a beautiful reminder that he can look back on for years to come. 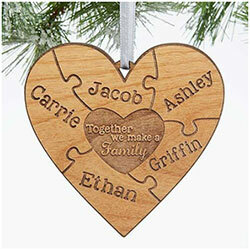 Wooden Heart Custom Family Ornament– This wooden family ornament can be made to include niece and nephew names as a heartfelt way to show you care for your favorite uncle. 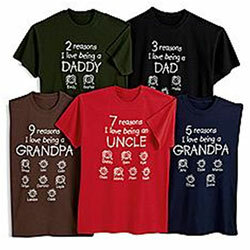 “Reasons I love…” Personalized T-shirt and Sweatshirt– In a variety of colors and sizes, these shirts can be personalized with a tile or name and up to 12 family member characters. Not only great for uncles, but other adults too! Who doesn’t love the “fun-uncle?” These ideas make perfect presents that match his interests and are sure to be as much of a good time as he is! Set of 4 Guitar Glasses – Each guitar glass represents an era of music. A wonderful choice for music lovers to have their own hall of fame right in their home! “I’m the Crazy Uncle You’ve Heard About” Premium 11 oz. Coffee Mug Gift Set – Everyone needs a mug that showcases exactly what makes them unique. This product is cleverly designed for the uncle(s) in your life. Printed on both sides for better visibility, your guy will love drinking his morning joe in this special mug. It even comes in a gift box! The Complete Manual of Things That Might Kill You: A Guide to Self-Diagnosis for Hypochondriacs – This hardcover book outlines, in great detail, the world’s worst illnesses that are organized by symptom. A unique gift idea for curious uncles with a sense of humor! Blade 720 Drone – This drone is one of several that is great for beginners. It is foldable and lightweight, and works independently flying in several pre-programmed ways, as well as accepting commands to follow you wherever you go. Lots of fun! 100 Movies Scratch-Off Poster – Never again will your uncle spend hours searching for a movie to watch at home! This scratch-off poster highlights 100 of the most iconic silver screen adventures of all time. New York Times Custom Front Page Puzzle – A great choice for sports fans, this front-page puzzle depicts the biggest win of his favorite sports team! It doesn’t have to be hard to shop for the uncles in your life. Use our carefully researched ideas for the 40 best Christmas gifts for uncles to make this holiday the best yet. You’ll be glad you did (and so will he when he opens them)!